Highlights: Animal Rescue Centre, Organic Ice Cream. Liza escorted five members of our group to an Animal Rescue Centre. This centre was established by two individuals who moved to Puerto Viejo from overseas and they met here and then married. As one was a veterinarian the locals kept bringing injuried animals to his house and eventually the couple decided to set up a rescue centre and seek help via volunteers and money to make a real difference. There is no government money so support comes from tourist visits. The Centre does tours twice each morning. In the afternoon they take most of the animals out into the forest and eventually the well ones decide to not come back. The afternoon outdoor sessions are important so that the recovering animals don’t get too use to humans looking after them. Some of the animals I saw included sloths, toucans, monkeys, owls, spiders, snakes, a caiman and frogs. 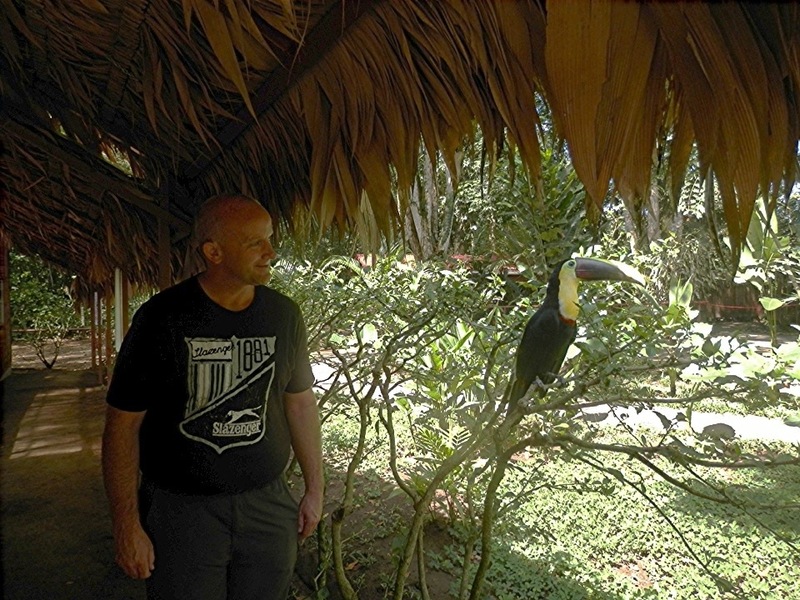 One of the toucans was just flying about the Rescue Centre grounds enjoying itself. They like to try and eat people’s toes so a good tip is to wear enclosed shoes! The was one owl that lost its mate and has been depressed for over two years. They mate for life and she has been struggling to eat for most of that time but the staff are hopeful that the owl is starting to get better. There was also a toucan who’s beak was damaged when it hit a glass window which means its food has to be cut up if it is going to eat. Unfortunately this toucan will need to stay in the centre for the rest if its life. I also supported the Centre by making a few purchases for my nieces and youngest nephew, I hope they like their gifts when I get back. It is inspiring to see so many people try to take care of animals that we have accidentally hurt. We caught a taxi back to town and Liza introduced us to an organic ice cream cafe. I had vanilla and berry extremely tastily :). I’m really going to have to go on a diet when I return. The last 50 days of touring has been lots of constant meals sometimes with high fat content. Later in the day we went to dinner and celebrated Dotty’s birthday with a small price of cake and a fairly good birthday song. Tomorrow it’s my 50th country when we cross into Panama.